A new study grapically illustrates our climate predicament, writes Colin Campbell-Hunt. By now we all know that we should try to keep the planet from warming by more than 2degC above pre-industrial levels. We are told that this will give us two chances out of three to avoid irreversible changes to the planet's climate. So what are these irreversible changes, and why are they irreversible? A paper in the August issue of the Proceedings of the (American) National Academy of Sciences (PNAS) by climate modellers in Stockholm, Copenhagen, Potsdam, Canberra, Arizona, Cambridge (UK), Stanford, Exeter, and the Netherlands, argues that looking at the earth as a single interdependent system gives us the richest view of the trajectories that could shape the planet's future climate. And they give us a sharp warning: the rapid increase in greenhouse gas emissions caused by human activity over the past 200 years is already switching on some of the changes that, if driven far enough or fast enough, may pass through a threshold beyond which they will continue unabated. What drives these irreversible processes is the phenomenon of positive feedback by which an initial change gets amplified over time. The most salient example is what is happening now in the Arctic. White ice reflects 80% of the sun's energy (an albedo effect), but when it melts to water, it absorbs 80% of the energy. So as the planet warms, there is less ice, more water and more energy is absorbed leading to more warming, less ice, more water, more warming etc, etc. The Arctic summer is now expected to be ice-free sometime in the 2040s: 20 to 30 years from now. The PNAS paper identifies 10 of these feedbacks, how soon they may be engaged, and for each of them the stimulus it would give to rising temperatures and carbon emissions over the rest of this century. Here is their list: thawing of Arctic permafrost; release of methane from the oceans; weakening of the capacity of land and oceans to absorb carbon; increased bacterial respiration in the oceans; Amazon forest dieback; boreal forest dieback; Arctic summer sea ice loss; reduction in northern hemisphere spring snow; Antarctic summer sea ice loss; polar ice sheet loss. Just one of these will work out over many centuries and have negligible effect over this century: the release of methane from the oceans. Some are already in play: Arctic and Antarctic summer sea-ice melting, release of carbon dioxide (CO2) and methane from permafrost, and reduction in northern hemisphere spring snow. The remaining five of the 10 could move into a positive feedback cycle - a tipping point - by the end of the century even if we do manage to keep average global warming within 2degC. The story does not stop there. These individual processes of positive feedback need to be understood as parts of an inter-connected Earth System with the potential to influence glaciers, the Indian monsoon, the northern hemisphere jet stream, the thermohaline circulation that moves water around the world's oceans over centuries - helpfully carrying CO2 down to the depths for hundreds of years - and the El Nino southern oscillation that affects our weather in New Zealand. These linking mechanisms can produce a knock-on effect from one positive feedback process to another, leading to a cascade of tipping points. The PNAS paper reports the modellers' attempt to capture all this complexity and describe possible future trajectories for the Earth System. The diagram tells the story. For the past 2.6million years of the current ice age (the 7th in Earth's history), the earth's temperature has swung predictably through time between long periods of cooling to relatively shorter periods of warming: so called glacial-interglacial cycles lasting up to 100,000 years. This is the trench on the left-hand side of the diagram, and for 2.6 million years the Earth System has stayed inside that trench. The past 12,000 years has been a period of inter-glacial warming (the Holocene) that has carried the Earth System to the right-hand (warmest) limit of that trench, and perhaps beyond. This is the period in which humanity evolved from hunter-gatherers to agriculturalists and all complex social civilisations emerged. The PNAS modellers estimate that human-induced emissions have already moved the Earth System beyond the limits that have applied for the last 2.6million years into a new higher-temperature region that is increasingly being referred to as the Anthropocene. From here, they say, cascades of positive feedback processes have the potential to carry us on to a much hotter world and a new stability for the Earth System; a ``basin of attraction'' they call Hothouse Earth. Once there, it would be at least 100,000 years before the Earth System could return to the climate patterns that have led to the world as we know it. Conditions in the Hothouse Earth basin would approximate those in the mid-Miocene epoch, about 15million years ago, when atmospheric CO2 was between 350 to 500 parts per million, temperatures were 4-5degC higher than our pre-industrial levels, and oceans 10m-60m higher than they are now. And here's the warning. According to the modellers, the point at which the Earth System may descend irreversibly into that hot basin appears to arise at about 2degC above pre-industrial levels. So if you ever wondered what might happen if we overshoot the 2degC target we have set ourselves, this is one good answer. 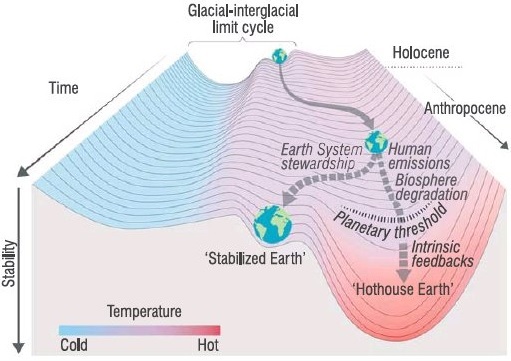 But the PNAS modellers also tell us that we still have the potential to stabilise the Earth System at the edge of this abyss, on the narrow shelf in the middle of the diagram. To reach that shelf would require all the strategies we are attempting now: deep cuts in greenhouse gases, and protecting and increasing the capacity of land and oceans to absorb CO2; for example, protecting Amazon and boreal forests and extending forest cover elsewhere. Other changes to humanity's influence on the planet would also be needed. The modellers offer 17 of these, including low-meat diets to reduce agricultural emissions from grazing animals, using alternatives to cement, reducing waste, and a slowing or reversal in population growth. To stay on that shelf would require unceasing effort on our part, for it would not be maintained by processes that are intrinsic to the Earth System. If we want that kind of planet we are going to have to sustain our efforts to keep it that way for millennia. Conditions here would approximate the mid-Pliocene epoch 3-4 million years ago, when CO2 concentrations were between 400-450ppm (as they are now), temperatures were 2-3degC higher than pre-industrial levels and oceans stabilised at a level 10m-20m higher than now. If all of this seems just too awful to contemplate, you might want to take refuge in the knowledge that most of the science community, and the Intergovernmental Panel on Climate Change, continues to model global temperature rising at roughly the same rate as CO2 emissions, and does not include the self-reinforcing processes of change that are the core of the PNAS analysis. It is also true that the PNAS modelling is speculative, telling us what might be, and not what will be. We will not have the evidence to test these speculations about the future until we are in it. On the other hand, this is speculation informed by extensive data on the Earth System as it has behaved over previous millennia, and as it is changing now, and modelled by one of the best climate models now available. If you like to know what risks we are running if we sail too close to a climate-changing threshold, this diagram should go up on your fridge door.